I would just like to let the newer players know that World of Tanks can be a little confusing at times. 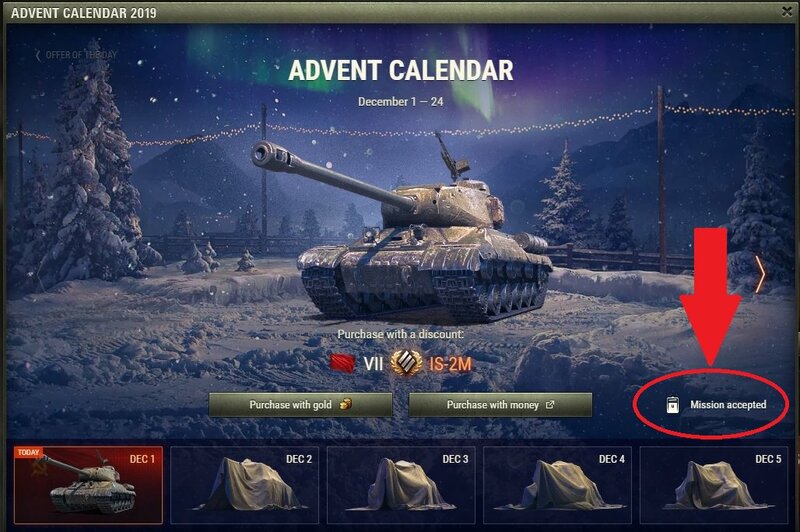 Right now, we have the Advent Calendar going on where you can purchase a different tank each day for cash or Gold (this is new). Coincidentally, there are Advent Calendar Missions that you can accomplish as well. But, in order to FIND these hidden missions, you have to go to the in-game STORE and click on Accept Mission in the lower right of the Advent Calendar page. It won't say what the Mission is, and you won't know what to do in order to accomplish it, but play your best and maybe, just maybe, you'll get it done. FYI - I played my Tier 9 STRV today and had 3,500 damage and 2 kills in a loss (always start off with 3-5 losses) but got the mission done. Not sure what did it, but I got it. Truly a secret mission. You should get a present for posting this kind of simply helpful info. Edit …. the mission is to get the Bruiser award. Edited by StoveBolt54, Dec 01 2018 - 17:21. Would have been nice if we just had warchild around back in 2011, well done sir. Thanks fellas. I just try to help out where I can. This is only my 2nd holiday season with World of Tanks, and I missed a bunch of stuff that I didn't understand last year. Bruiser, btw, for any that do not know -- Damage at least 5 modules or crew members in a match. Thanks for the heads up, even i didn't know about this. Have an updoot. After accepting the mission it will show up under the other mission tab, the very last one. today is 45k credits for top 5k damage. your damage only counts if you're top 10 after battle. Edited by gmotoman, Dec 03 2018 - 20:20. Ack! I was wondering where these went. I hate missing stuff. TYVM. Not sure why they don't advertise the daily mission with the daily tank bundles in the news feed. Because THEY don't require you to BUY your way to them. If there's no money in it for them, then they 'conveniently' ignore it and force you to explore. Today's was pretty easy and I don't even know what it was - but I got it. I believe for 12/5 it was earn a Fire for Effect badge. I missed some? Oh, well. Easiest way I've found to get to the Advent Calendar if it doesn't pop up after you log in. Is to click on the bulletin board to the left of your Christmas tree in the garage. It's also a way to quickly check if you accepted the day's mission if you can't remember. Game Discussion → Newcomers' Forum → PSA: Advent Calendar Missions - Don't Forget! Game Discussion → General Discussion → PSA: Don't Forget Advent Calendar MISSIONS!